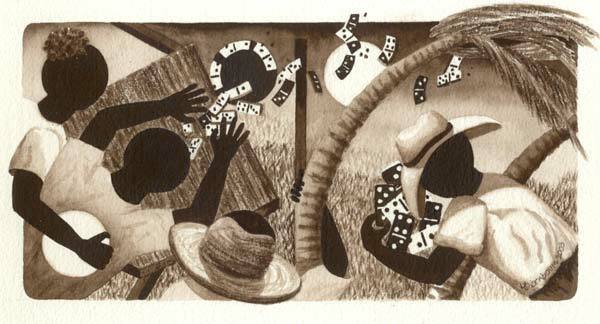 "I have always been impressed by the way Anguillians use dominoes as a socializing event. Gathering of players, talking about the days past, about the future days, gossiping neighbors, government, post office, airport, ferry, etc. The idea came to me as: play or get played. Players slam dominoes. Secret sign to partner? Intimidation? Desperation? Or just tradition? The canvas itself is of the same 1 to 2 ratio as a domino, because if you look closely, it is a domino! Lots of fun to build the images of the players into the domino. Everyone loves them." I never noticed! See how the painting itself is a domino? See the playing spots (3 and 1)? Hence the "4" in the title.